When I perform a Restore via NMC Restore Wizard and Choose "Choose a location", then Protection Manager build the entire original Path under the selected Location. Is this working by design or can I set a Option, where the RestoreJob restore the File directly under my selected Folder (eg. vfiler:/volume/qtree/user/Restore/test.txt) without the entire original Path. In The Step "Restore Path" inside the Restore Wizard I can Browsing only till the qtree. All Folders under the Qtree I have to enter manually... Is that a normal behaviour? Its working as expected. The behavior you are expecting is coming in version 5.1. If you would like to take a sneak peak pls signup for the BETA. Below is the link to the same. 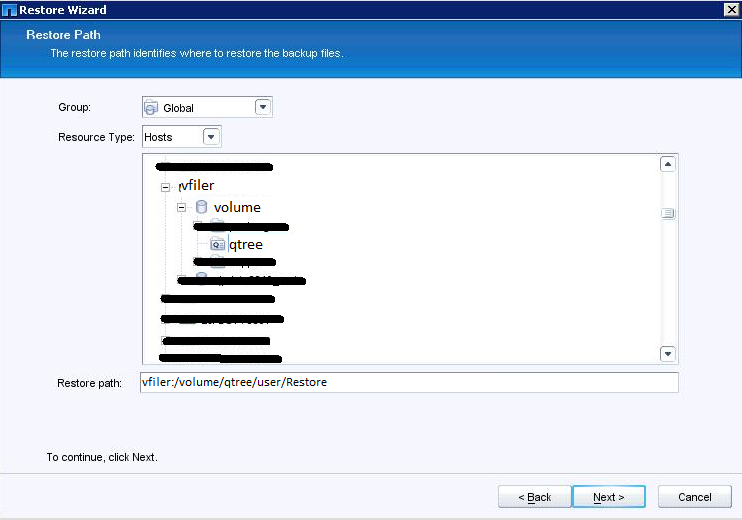 The exact requirement is met there "Eliminate the requirement to include original directory path when restoring to an alternate location"
Yes, as you know in dfm we only discover NetApp Storage objects and not directories. And yes you will have to manually enter your location if you want to restore in directory inside a qtree. Thanks for the quick response... I will signup for the Beta Program..